If you wanted a small, but complete, Hamilton collection you could try to locate the two models with chromium plated nickel silver cases... one is the 1960 Sea Rover and the other is the 1959 Sea-Scout. They're the only two models to use this unique case material. I don't know the history, or rationale, for the two models but I suspect they were an experiment to see if the material would be a good candidate for future entry-level models. Both were replaced in 1961 with B models - when the case was changed to all stainless steel. No change in price was involved. $45 may not seem like a lot of money today, but in the early 1960's that was equivalent to over $350 in today's dollars. 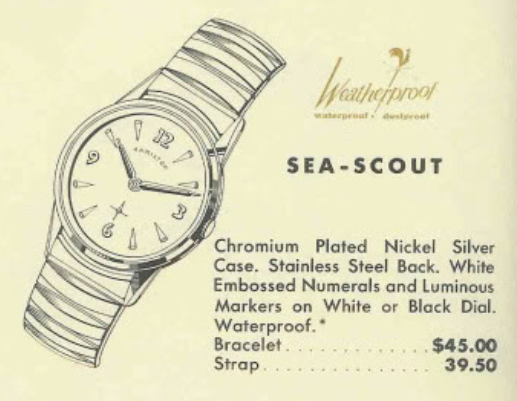 Even though it was an entry-level model, the Sea-Scout was not your garden variety timepiece by any other standard. Tucked inside the case is a 17 jewel Hamilton 673 manual winding movement. In front of the movement is an embossed dial with silver numerals and markers. It was available in white or black and it's most unique feature was a linen-like texture. My project watch arrived in decent-enough shape but has arguably seen better days. Everything looks to be original so we'll see what a good cleaning will do for appearances. The stainless steel back is held in place with a threaded ring. I hate this style of case. I find it's very hard to get a good grip on the ring with a case opener - especially if it's on tight - as you need to overcome the threads as well as any friction between the ring and the back. The movement is rust-free but definitely in need of an overhaul. The inside of the case back looks much better than the outside - that's for sure. This is one of a few models with a made-in-Germany case. Notice the tab on the case back - that aligns the back with the case so the ring can seal tightly. Everything is cleaned and dried. Say what you will about the Swiss-grades in Hamilton's line up but they are very easy to work on. They may not be as pretty in appearance but they keep time just as well as their American counterparts. The last thing to go on to the back of the movement is the balance. With a few winds to the mainspring, the watch should start running as soon as the balance is in place. The 673 is now ticking away with good motion. A few tweaks to the regulator gets the beat rate to just a little fast per day - I'll leave it there while everything settles in. The Sea Scout is one of the few round watches with a special crystal. It has a low profile and a white reflector ring. You want to hold onto the old crystal though so you can reuse the silver reflector ring. Installing these crystals can be a pain since you can't compress the crystal with the ring installed - so you need a crystal press to insert it. With the watch back in running order with a new strap and a new crystal, you can see that the chromium plating has a few chips and dings here and there. 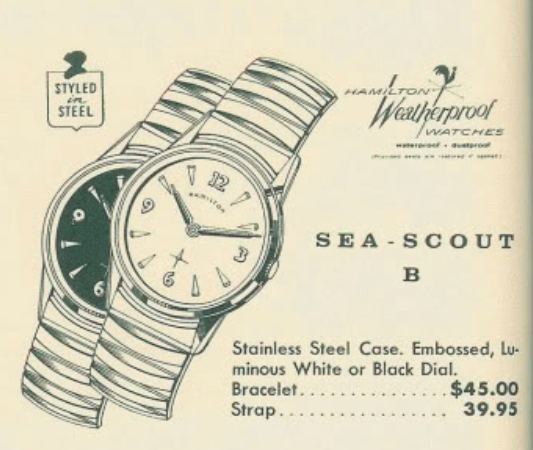 It's not too bad but you can see why Hamilton switched over to an all stainless-steel case for the Sea-Scout B.